The shortlist was announced by X-Men actor Hugh Jackman, who said teachers were the “real superheroes”. 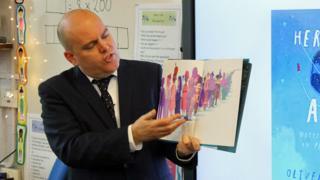 His runs projects for pupils to “meet others of different races, religions and cultures”. Announcing the finalists in a video message, Jackman said: “I can tell you right now, from where I stand, with all my experience, the real superheroes are teachers – they’re the ones that change the world. “My favourite uncle was a teacher. My sister is a teacher. My brother is a teacher. And I have always felt the most important job in the world is teachers. The other finalists are from Georgia, Brazil, the Netherlands, India, the United States, Argentina, Australia, Japan and Kenya.